From MEMRI….always a reliable source. 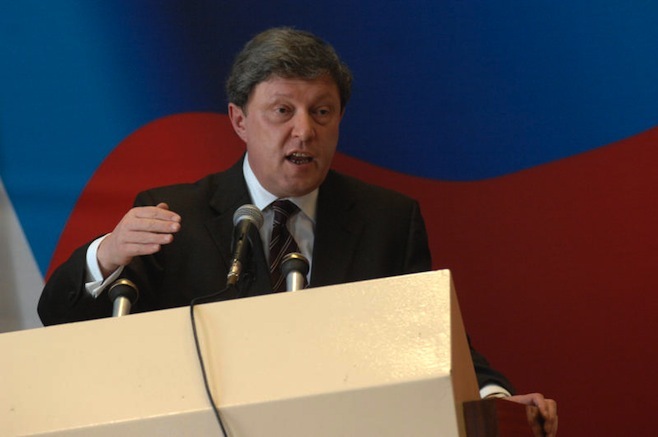 An article by the leader of the liberal Russian party Yabloko, Grigory Yavlinsky, titled “Russia’s Deadlock in Syria” was posted on his party’s website on April 13, 2017. In his article, written in the aftermath of the chemical weapons attack on Khan Sheikhun and the American retaliatory strike on the Shayrat base, Yavlinksy flayed Putin’s policy in Syria. He claimed that Assad was a loose cannon who controlled Russia more than Russia controlled him despite Russia’s costly investment in the Syrian regime. Furthermore, Russia’s policy had left it without reliable allies in the region, while alienating the Trump administration in which Russia had placed such high hopes. “How can it be still unclear to someone that Syria is a trap for Russia? Russia was led into the Syrian trap by the stupidity of Russian foreign policy, its short-sightedness and adventurousness. Any further steps targeted at escalation of Russia’s military actions in Syria only aggravate our situation. The suspension of the memorandum envisaging the mechanisms to avoid incidents between the United States and Russia in Syria means that any stupidity or accident can now lead to a direct clash. “Contrary to common sense, Russia has been struggling to protect Bashar al-Assad. Putin sympathizes with the Assad regime, and our country, having started the war on his side and sending its military to Syria, has become a hostage to this regime. A big political stake was put on the Syrian president and preservation of his power. However, in reality, Russia does not control Assad, either politically or militarily. And it is not Russia which determines the strategy and tactics of military operations and political maneuvers in Syria (in particular, in the inter-Syrian negotiations). “It is also impossible to rely on Assad. Moreover, the Syrian president does not fully control the situation even in the territories under his control, not to mention the zones of military operations. Nevertheless, the Russian leadership has turned Assad into a symbol of its foreign policy and now cannot give up [supporting] him, even when his crimes drag Russia behind him into a shameful pit. It turned out that Russia fails to effectively protect Assad from Americans either. It has become obvious after yesterday’s destruction by the Americans of the base of the Syrian air force. The US attack showed that, if necessary, they would do whatever they want. “The Russian partnership with Turkey is not merely fragile; it is a part of the trap. “Moreover, Russia’s policy has also led to dependence on the decisions of the extremely inconsistent and unstable Turkish regime. All the plans for a joint action, all the “bridges” with the regime of Recep Tayyip Erdogan collapse, as we can see, in an instant and unilaterally. Turkey actively supports the US and opposes Assad and Russia in the present Syrian crisis. “Iran has been naturally pursuing its own interests and has also achieved its goal: it firmly tied Russia to itself, embroiled Russia with other interested parties and made Russia its tool. By the way, it cannot be completely ruled out that it was Iran that somehow provoked the use of chemical weapons in Khan Sheikhun. “Israel, which traditionally strives for good relations with Russia, has sharply condemned the use of chemical weapons, showing no doubt who did it, and supported the American strike against Syria. This was to be expected. Israel is very concerned that new weapons have got into Hizbullah’s hands and that Sh’iite militants have had good training under the guidance of Russian instructors. In addition, after the Israeli air raids on Syrian targets and summoning of the Israeli Ambassador to the Russian Foreign Ministry, it became clear that a crisis had emerged in the relations between the two countries. But it is much more difficult for the Russian aviation to operate in the region without the neutrality of Israel. Jordan and Saudi Arabia have certainly also supported the actions of the United States. “In such a situation under the present “chemical” crisis, Russian politicians and diplomats have, as usually, continued to confront the whole world, stubbornly defending the military dictatorial regime of the Syrian president. Delaying the UN investigation into the bombing with the possible use of chemical weapons in Khan Sheikhun, Russia has virtually proposed to play the fool – proceed, so to speak, from the presumption of uncertainty, as if saying “something happened, let’s start from a clean sheet finding out what happened and who was to blame”.